The RP Photonics Buyer's Guide contains 52 suppliers for laser mirrors. RP Photonics has the powerful RP Coating software for designing optimized laser mirrors, taking into account a wide range of properties. Figure 1: Dielectric laser mirrors. The photograph has been kindly provided by EKSMA OPTICS. Of course, laser mirrors can also be used to reflect light outside the laser resonator. For example, it is common to use a pair of steering mirrors, each deflecting the beam by ≈ 90°, for sending a laser beam into some apparatus. The mirror mounts of the steering mirrors typically have two or three adjustment screws, which make it possible to adjust the virtual origin and direction of the beam. For most laser mirrors, the surface quality in terms of the density of localized imperfections is particularly important. This is mostly to avoid beam distortions, particularly in lasers designed for diffraction-limited output beam quality. As explained in the article on mirrors, the surface quality is often quantified with “scratch & dig” specifications according to the US standard MIL-REF-13830B, or alternatively in a more rigorous fashion based on ISO 10110-7. It is important to know whether the values refer to the surface or to the wavefronts upon reflection, since the resulting wavefront errors are twice as large. One needs to know whether specified numbers are peak-to-peak or r.m.s. values. Further, it is of interest whether the numbers are typical or guaranteed worst-case values. Mostly for Q-switched lasers, the threshold for laser-induced damage is important. Some laser designs, involving particularly high optical intensities on resonator mirrors, work only with mirrors having a particularly high damage threshold. That can be achieved by choosing appropriate coating materials in conjunction with high-quality fabrication processes. Note that even for given materials, the damage threshold can be substantially reduced by impurities or microscopic defects. Even highly reflecting laser mirrors have some residual transmission. Particularly in solid-state lasers, this can lead to additional output beams with substantial powers, which are sometimes used for diagnostic purposes, such as for monitoring the laser power without using a part of the output beam. However, problems can arise from the nonuniformity of the residual transmission, which can be strong for highly reflecting mirrors. Many laser mirrors simply need to be highly reflecting for laser wavelength. In some cases, however, one needs additional properties, for example high transmission for pump light at a shorter wavelength. One then needs to use dichroic mirrors with a more sophisticated then-film design. 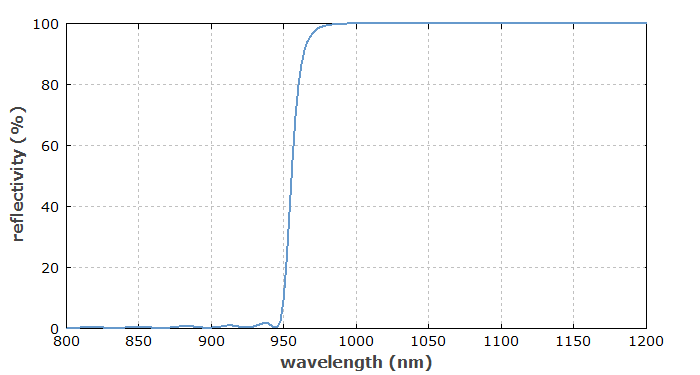 For example, Figure 2 shows the reflectivity spectrum of a short-pass mirror, which could be used for an end-pumped Nd:YAG laser: pump light at 808 nm, for example, is well transmitted, while laser light at 1064 nm is fully reflected. 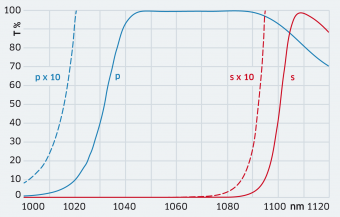 Figure 2: Reflectivity curve of a dielectric edge filter with high transmission below 980 nm and high reflectivity above 1030 nm. In other cases, it is necessary to have high resonator losses at unwanted laser lines. For example, a Nd:YAG laser can be forced to operate at 946 nm if the stronger laser line at 1064 nm is a sufficiently suppressed by high transmissivity of at least one mirror in the resonator. Usually, laser mirrors are fabricated based on glass substrates (e.g. BK7 or fused silica), but it is also possible to deposit mirror coatings directly on a laser crystal (or glass), e.g. for monolithic lasers. Typical mirror substrates are of cylindrical shape, with a diameter of e.g. 1 inch (≈ 25.4 mm) or 0.5 inch, and a thickness of e.g. 6 mm. Even for highly reflecting mirrors, some substrate properties can be important, in particular the surface quality, but also high stiffness, a low thermal expansion coefficient and/or a high thermal conductivity (to avoid thermal bulging in high-power lasers). For partially transmitting mirrors, it can also be important to have a high optical homogeneity (to avoid beam distortions for the transmitted light) as well as low absorption and scattering losses. Mirror substrates may have curved surfaces, leading to focusing or defocusing laser mirrors. The effective focal length is one half the curvature radius, assuming normal incidence. For strong curvature, e.g. with a radius of curvature well below 10 mm, it can be difficult to obtain high-quality mirror coatings. Some specialists can make good mirrors with radii of the order of 1 mm. Laser mirrors are often placed on adjustable mounts (see Figure 2). By turning two or three adjustment screws, one can align a laser resonator, for example. High-quality mounts allow for stable mounting while applying little mechanical stress to the mirror substrate, and exhibit a long-term stable mirror orientation with little influences of temperature changes. 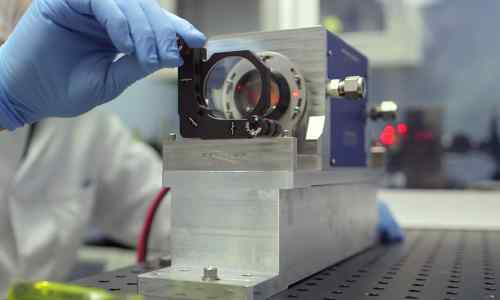 Figure 3: A laser mirror as part of a diode-pumped laser is placed on an adjustable mirror mount. The adjustment screws allow one to align the laser resonator. Source: Cutting Edge Optronics. 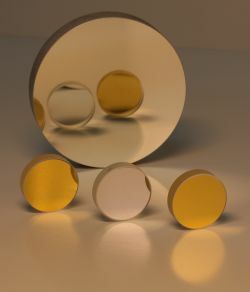 Special types of dielectric mirrors such as chirped mirrors (or other kinds of dispersive mirrors) can also provide a suitable amount of chromatic dispersion in the resonator of a mode-locked laser. It may then be possible to avoid the use of, e.g., a prism pair and thus to construct fairly compact femtosecond lasers. There are also supermirrors with extremely low reflection losses, but these are rarely used in laser resonators. Metal-coated mirrors, such as silver mirrors, are normally not suitable for laser resonators, because they have much higher reflection losses and are also not suitable as output couplers. Also, they tend to oxidate on the surface and thus to lose in surface quality and reflectivity. Femtoline laser mirrors are designed to be used in femtosecond laser applications with fundamental wavelengths of Ti:sapphire and Yb:KGW/KYW lasers and their doubled, tripled or quadrupled frequencies. Nd:YAG laser mirrors are designed for Nd:YAG Laser fundamental wavelengths and its harmonics: 1064 nm, 532 nm, 355 nm, 266 nm. NANEO Precision IBS Coatings GmbH manufactures high-precision IBS-coated laser mirrors for kilowatt-lasers, high power beam combining mirrors, phase-controlled mirrors, and dispersion-controlled GVD mirrors for femtosecond lasers with high powers.